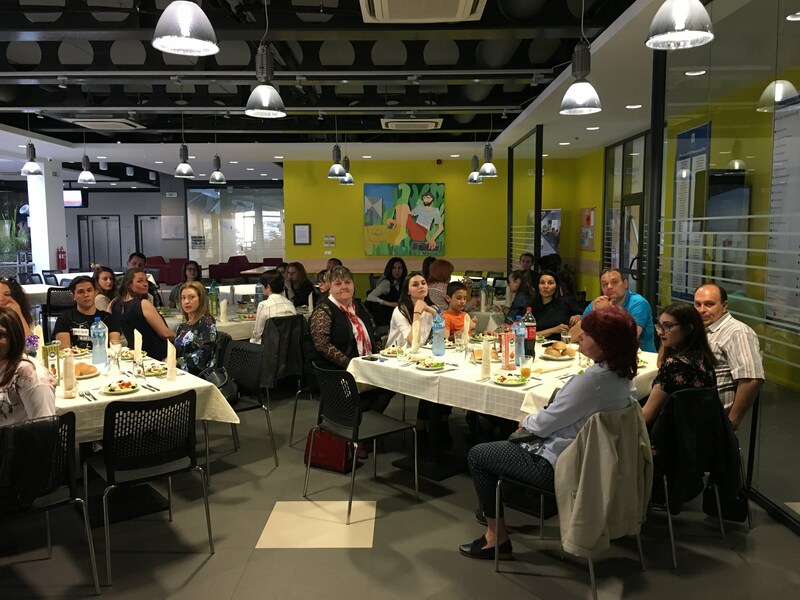 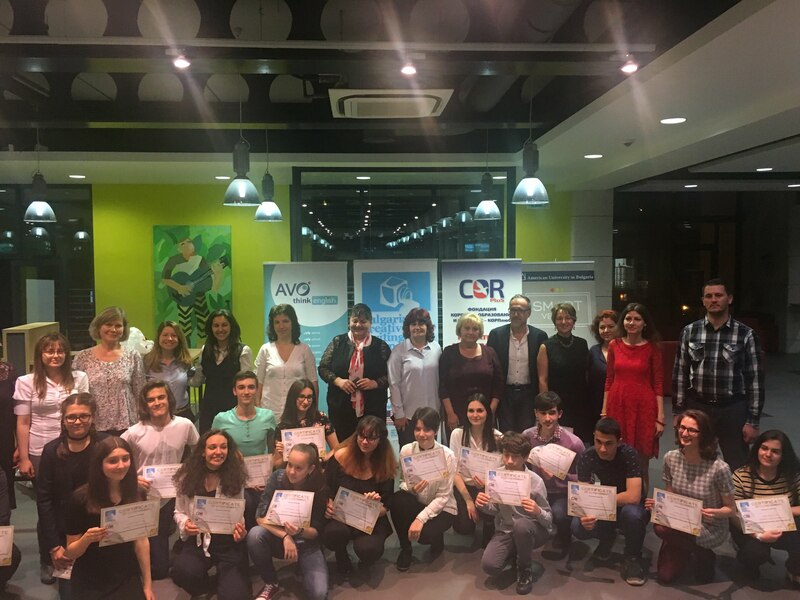 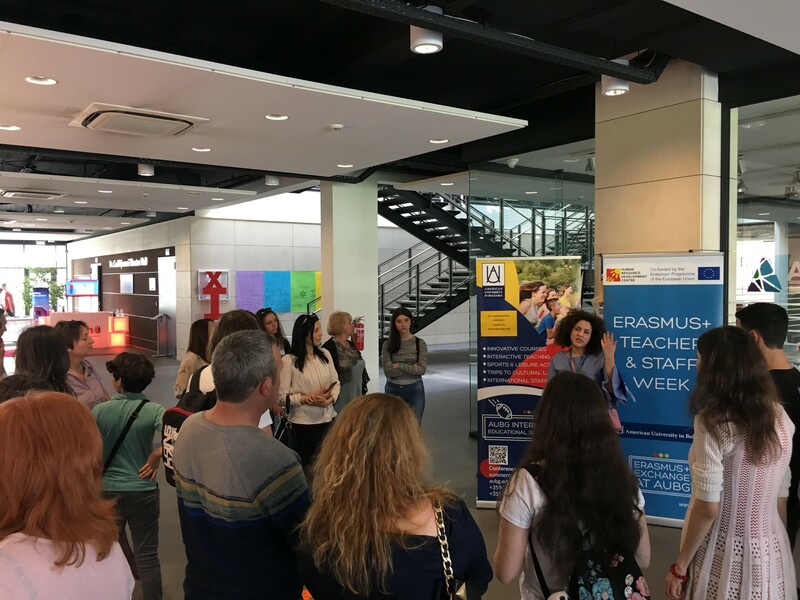 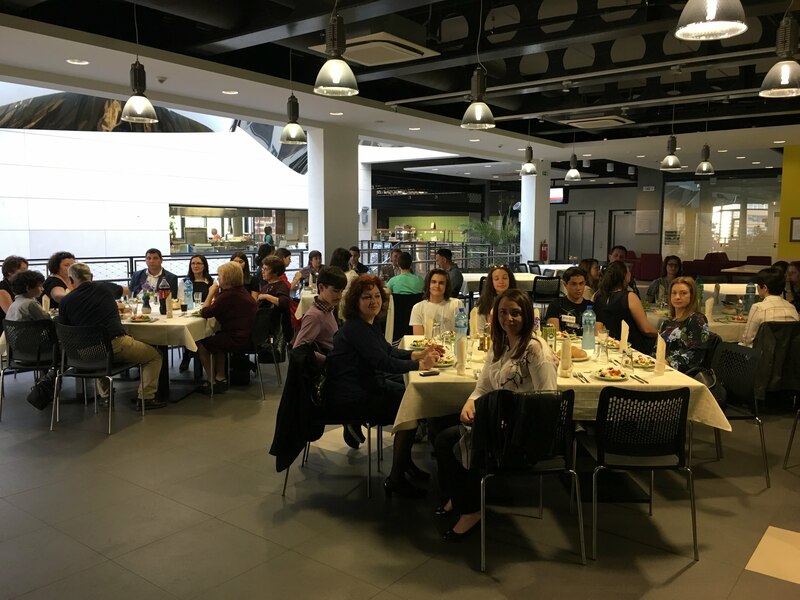 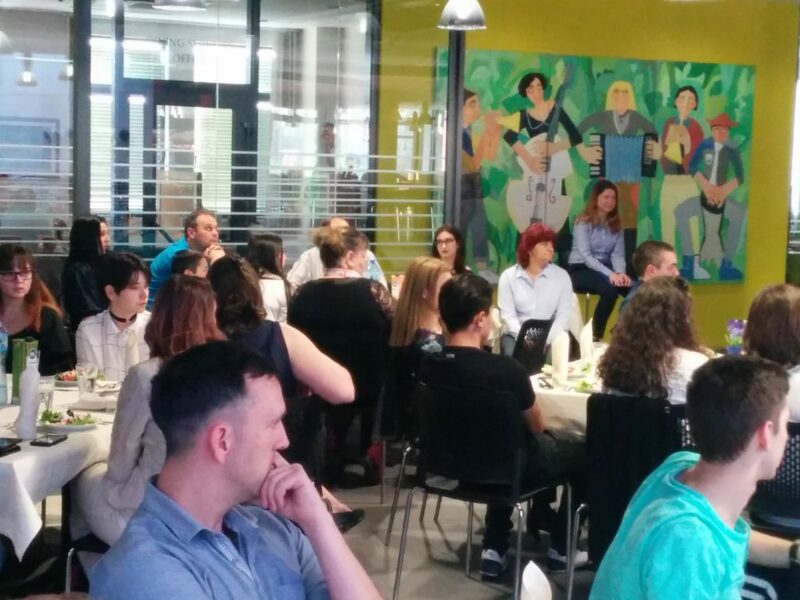 On April 14th, 2018 at the American University in Blagoevgrad we celebrated the achievements of this year’s winners and their teachers. 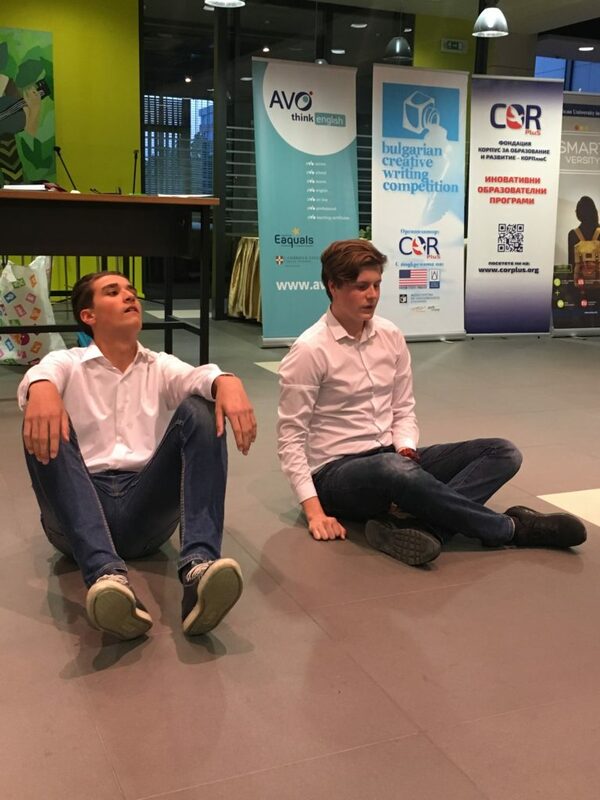 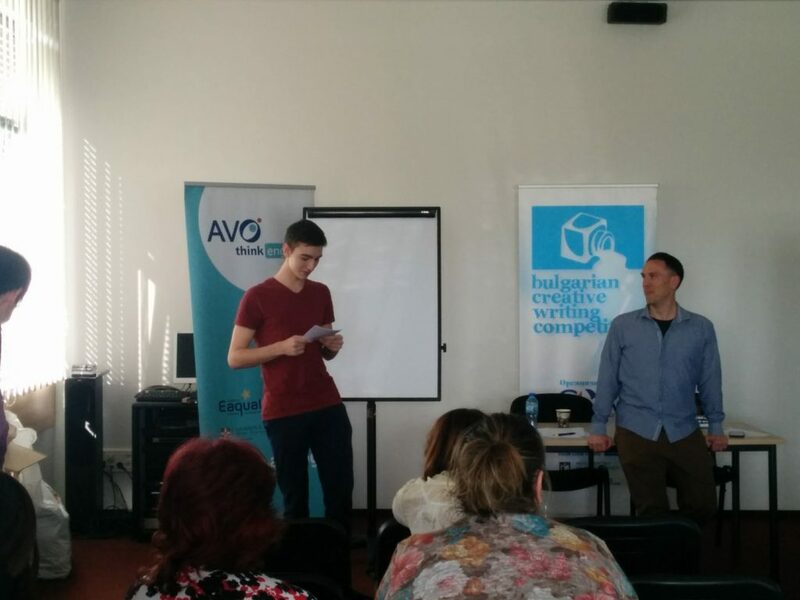 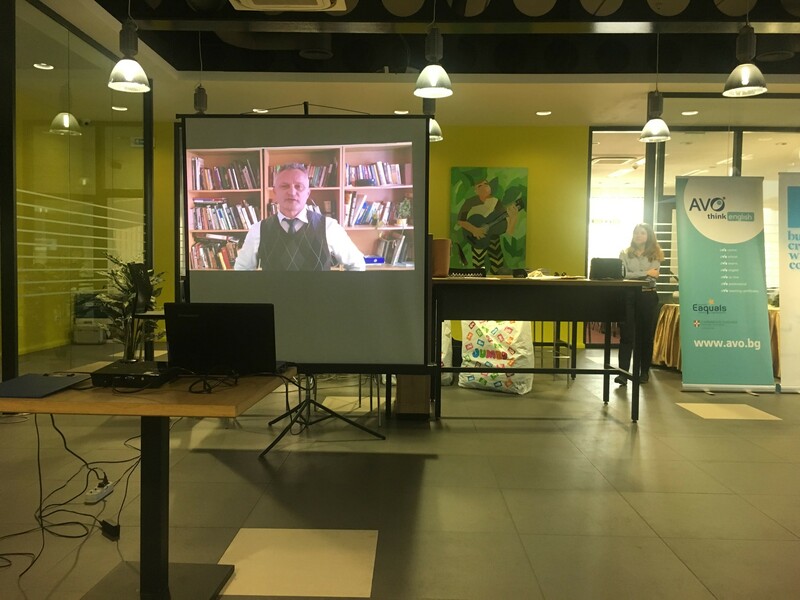 All participants had the opportunity to visit the university campus and participated in a creative writing workshop facilitated by Steven London – a student at the AUBG and a published writer. 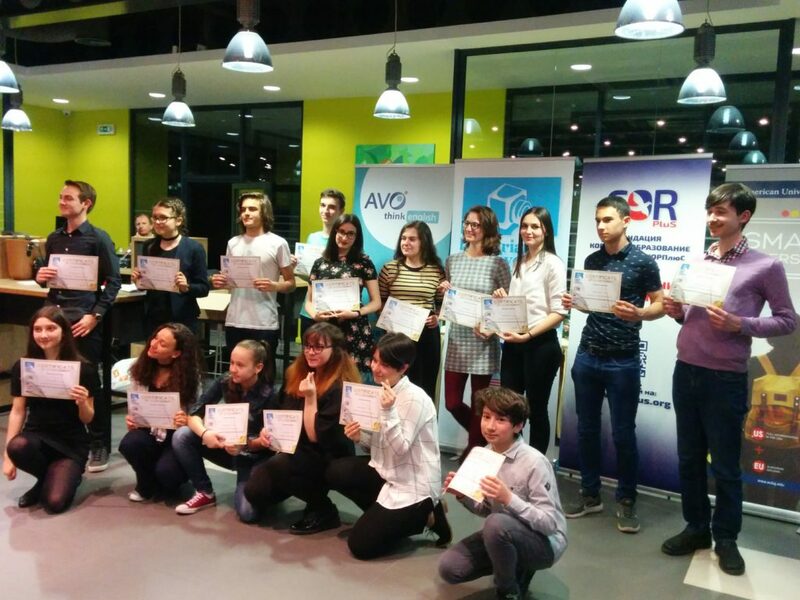 The award ceremony itself is a very special occasion and a true celebration of creativity. 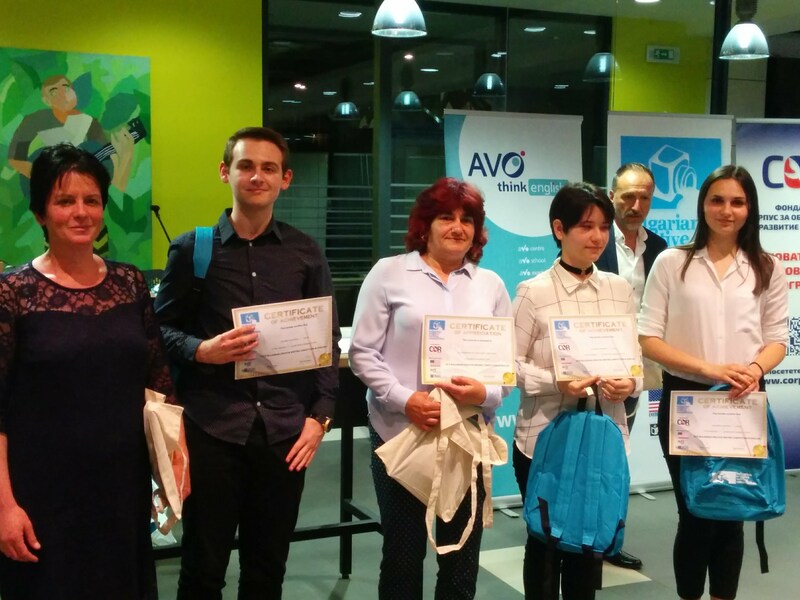 During the course of the evening we presented all winning works and had the opportunity to meet the young writers and their teachers. 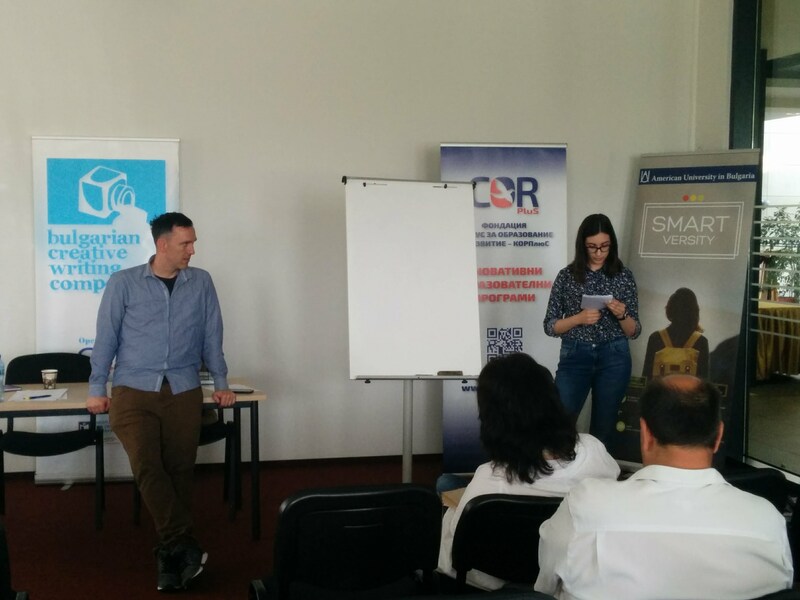 We had a guest performance of Shrek by Dimitar Borumov and Anton Velev from Akad. 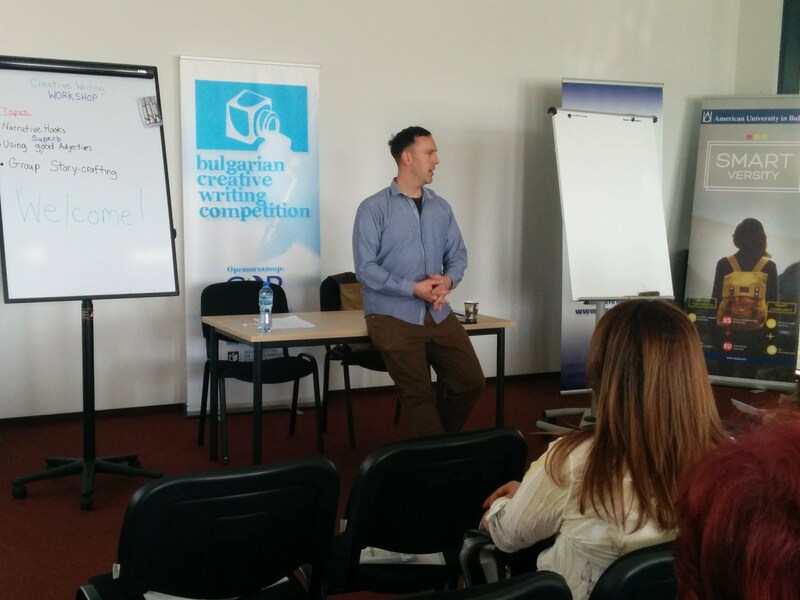 Sergey Pavlovich Korolyov Math and Science High School, Blagoevgrad. 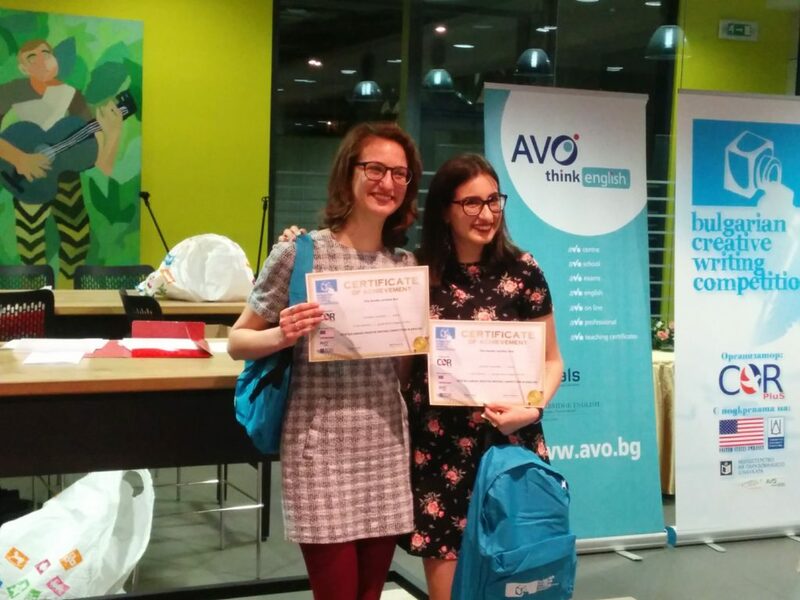 Two of this year’s winners – Elina and Yana, also performed during the ceremony. 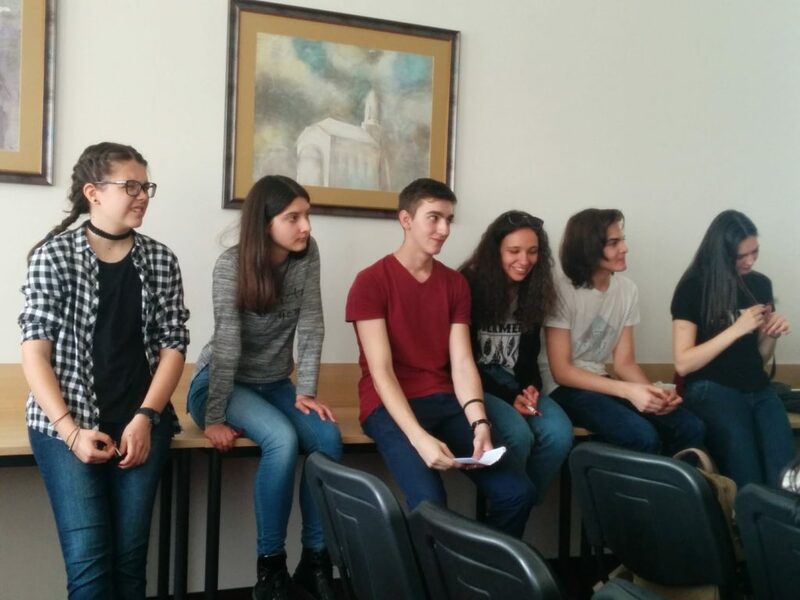 Elina Stancheva from Vasil Karagyozov Language School, Yambol sang a beautiful song and Yana Petrova from St. st. Cyril and Metodius High School, Kozloduy showed us a K-Pop dance. The students and their teachers received prizes provided by CORPluS Foundation, Klett and Express Publishing. 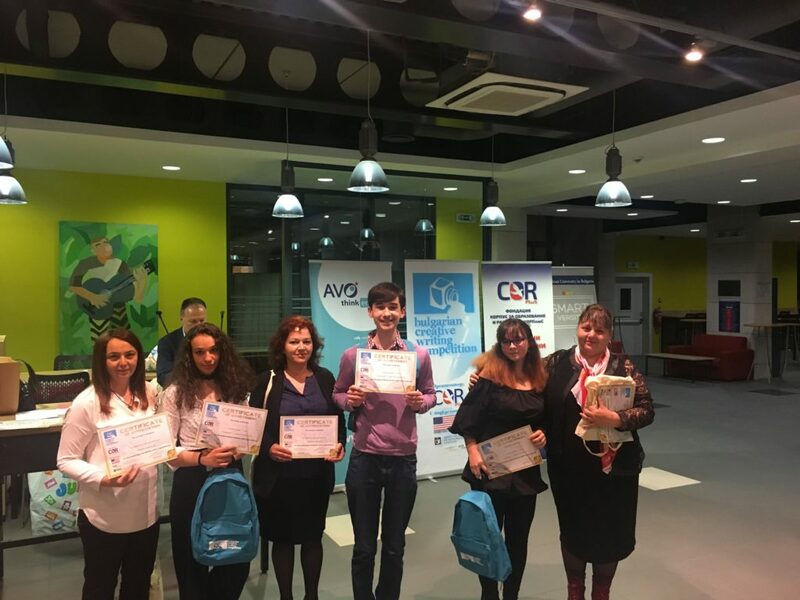 Zachary Karabashliev – the chairman of the national jury, gave two special awards for the students whose stories impressed him the most – Yana Petrova (St. st. Cyril and Metodius High School, Kozloduy) and Yasen Shopov (First English Language School, Sofia). 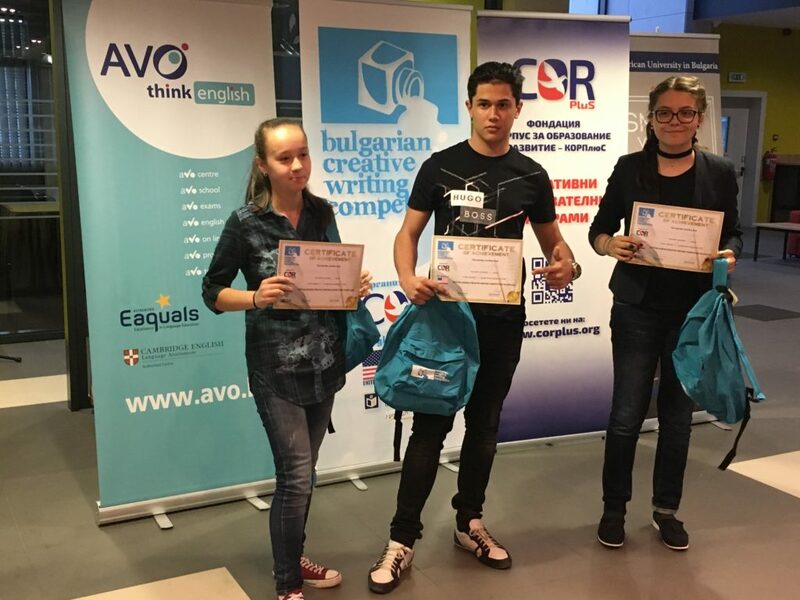 The American University in Blagoevgrad awarded Gabriela Krumova (First English Language School, Sofia) with a three-week summer camp and Yasen Shopov (First English Language School, Sofia) with an intensive TOEFL course. 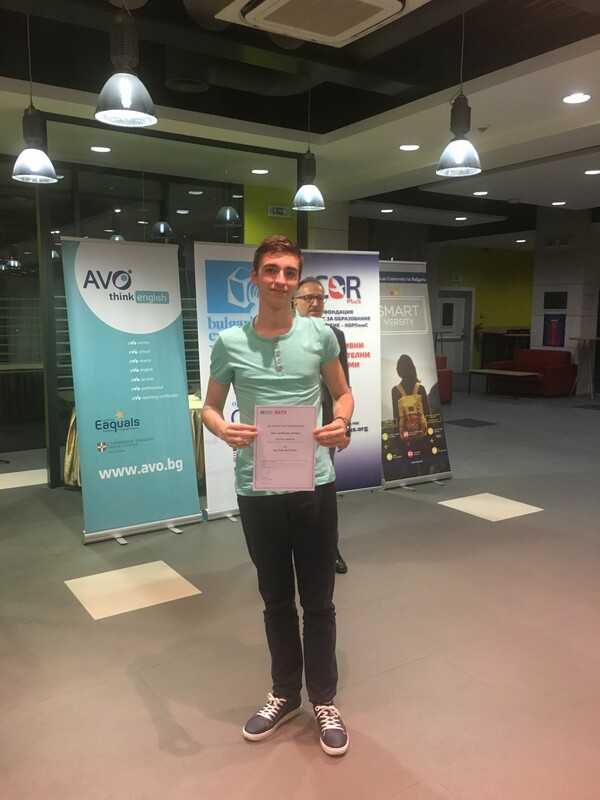 The special prize provided by British Council – a free IELTS exam, was awarded to Nicholas Brintnol (Tsanko Tserkovski High School, Polski Trambesh). 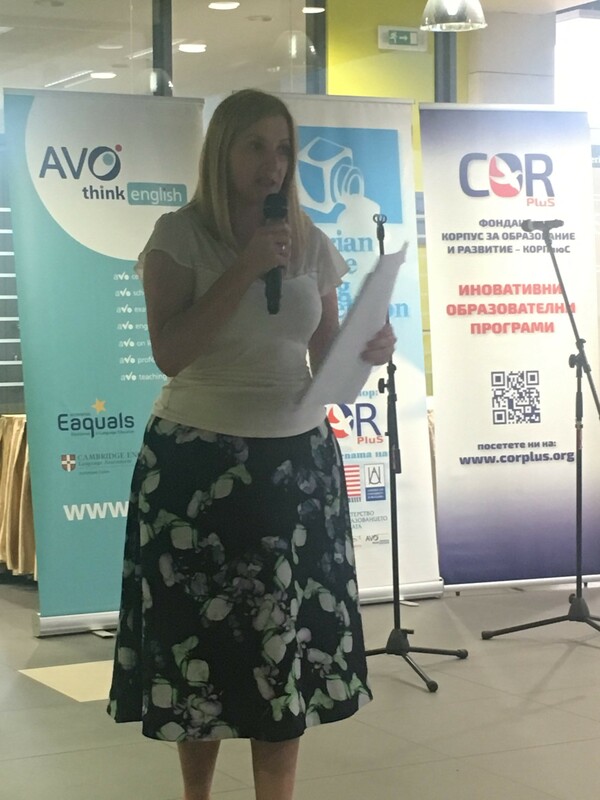 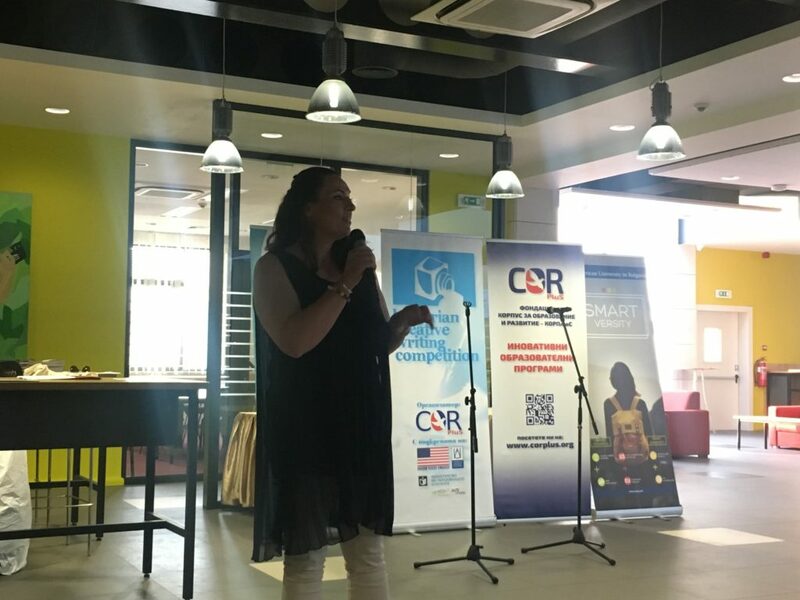 Viktoria Koleva (Prof. d-r Asen Zlatarov Language School, Veliko Tarnovo) received the special prize in the name of the American writer Cynthia Phoel who was a former Peace Corps volunteer in Bulgaria. 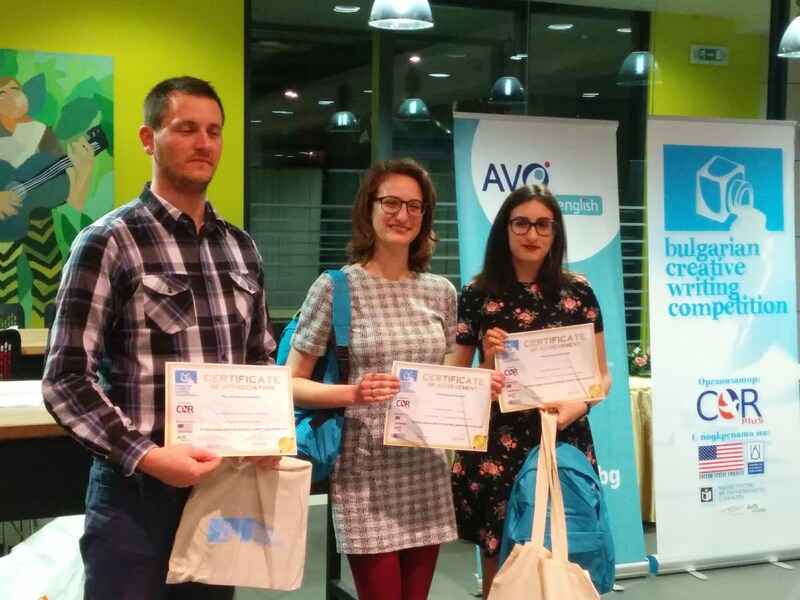 The award ceremony marked the closing of this year’s campaign and we are now looking forward to the 9th Bulgarian Creative Writing Competition. 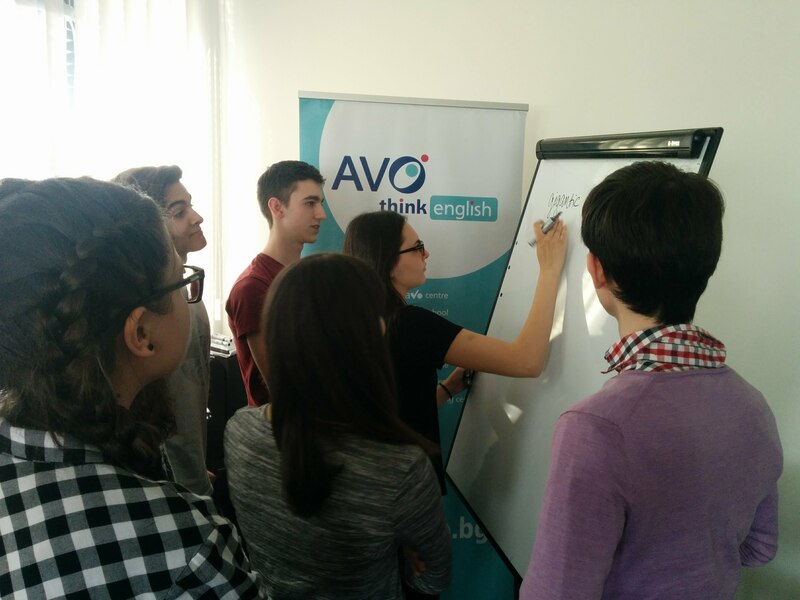 The students had fun during the creative writing workshop facilitated by Steven London – a student at the AUBG and a published writer. 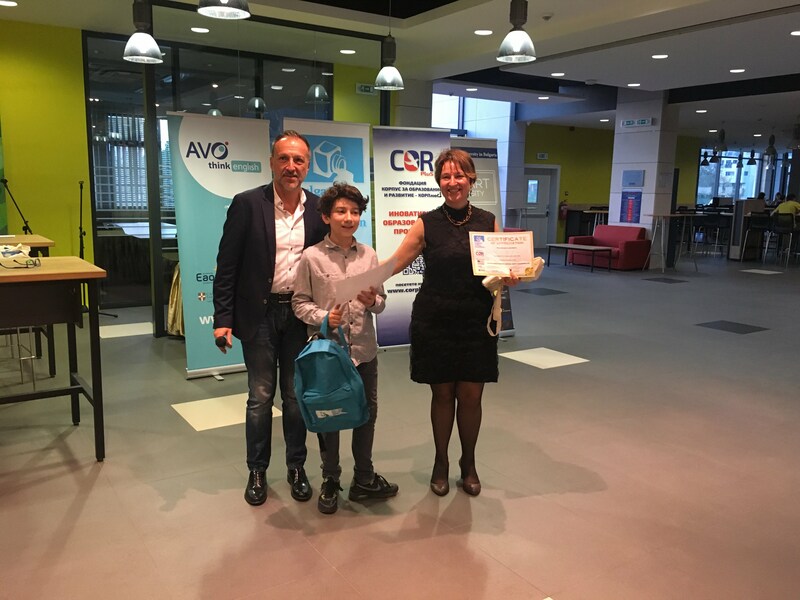 Alexander Koukov, (Sofia Math and Science High School) – 1st place among the 6th graders. 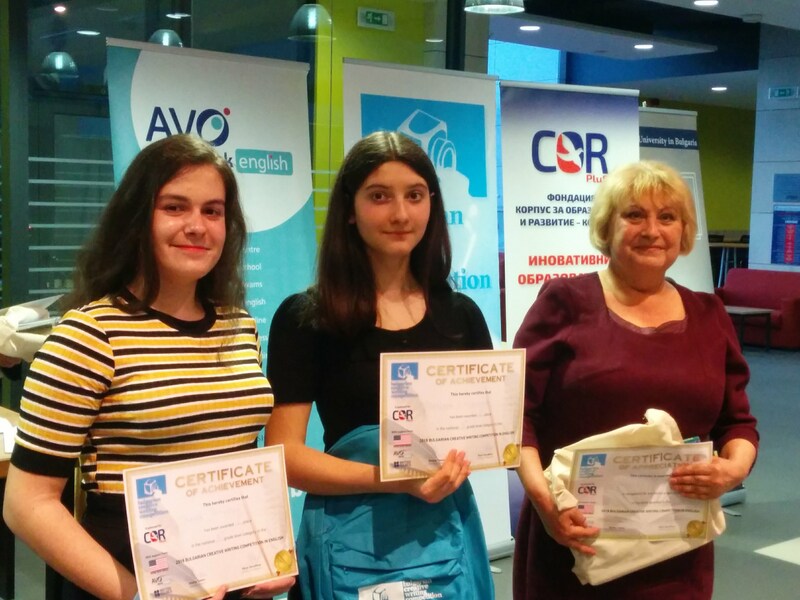 Irena Petkova (Vasil Aprilov Primary school, Burgas) and Preslava Gyuzeleva (P. R. Slavejkov Primary school, Burgas) – 1st and 2nd place in 7th grade category. 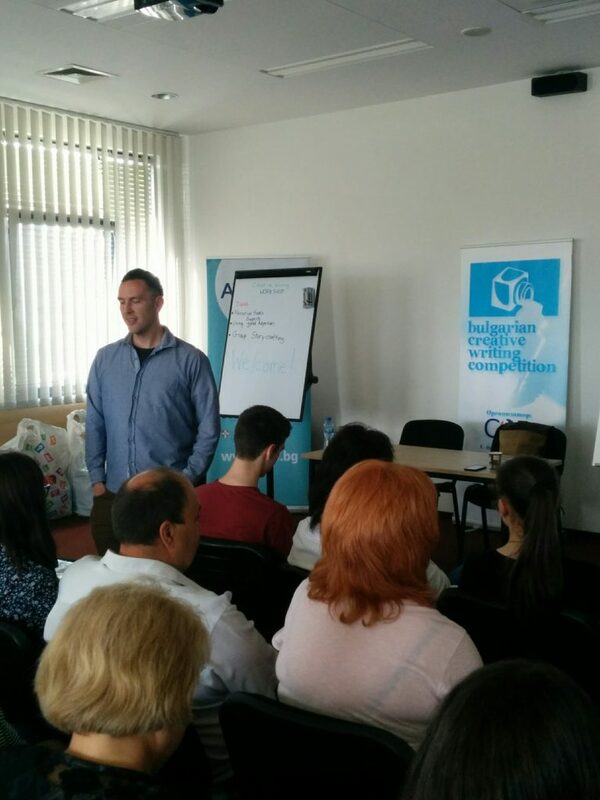 And Preslava’s teacher – Temenuga Peeva. 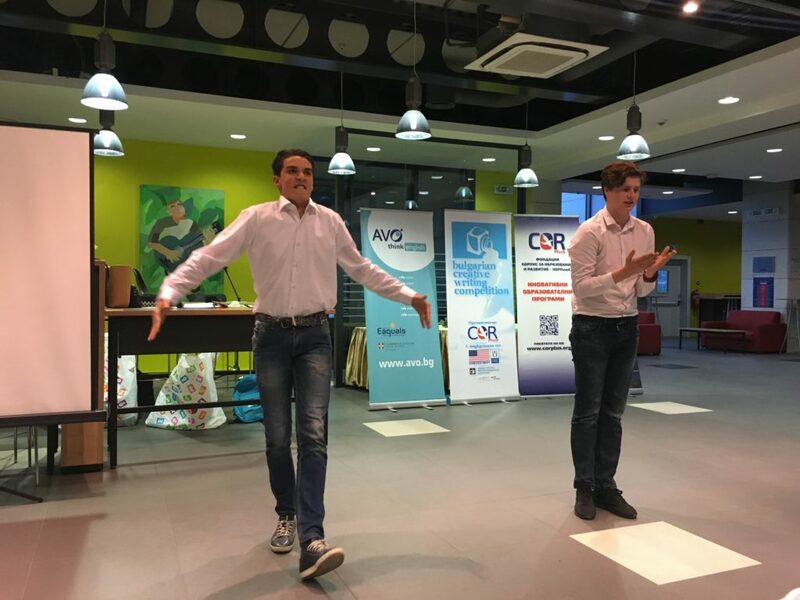 We had a guest performance of Shrek by Dimitar Borumov and Anton Velev from Akad. 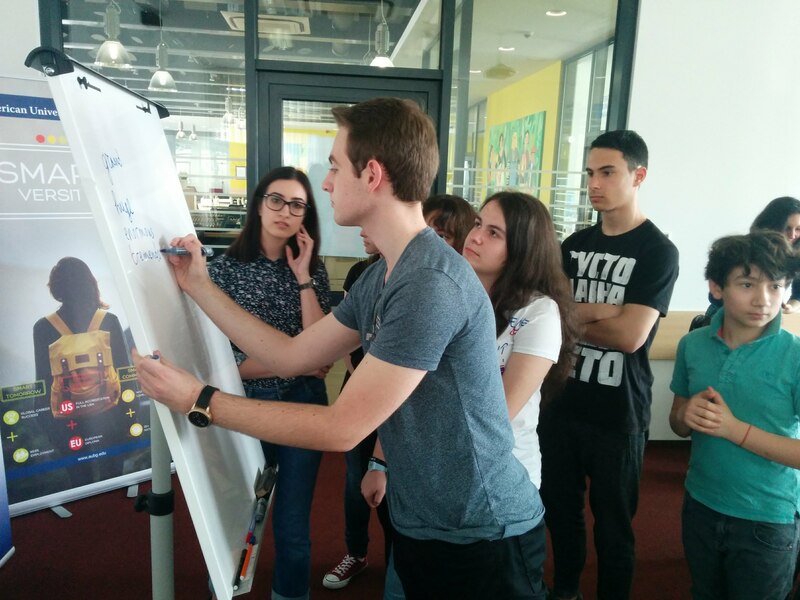 Sergey Pavlovich Korolyov Math and Science High School, Blagoevgrad. 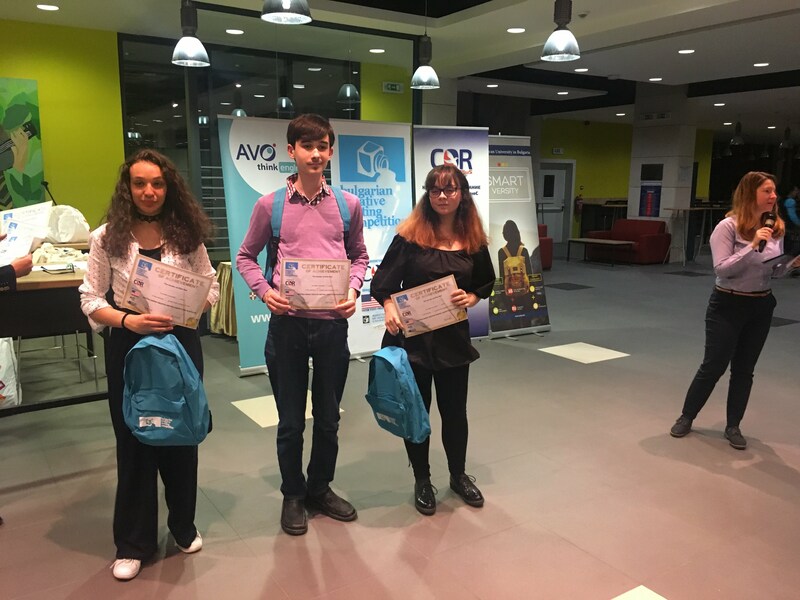 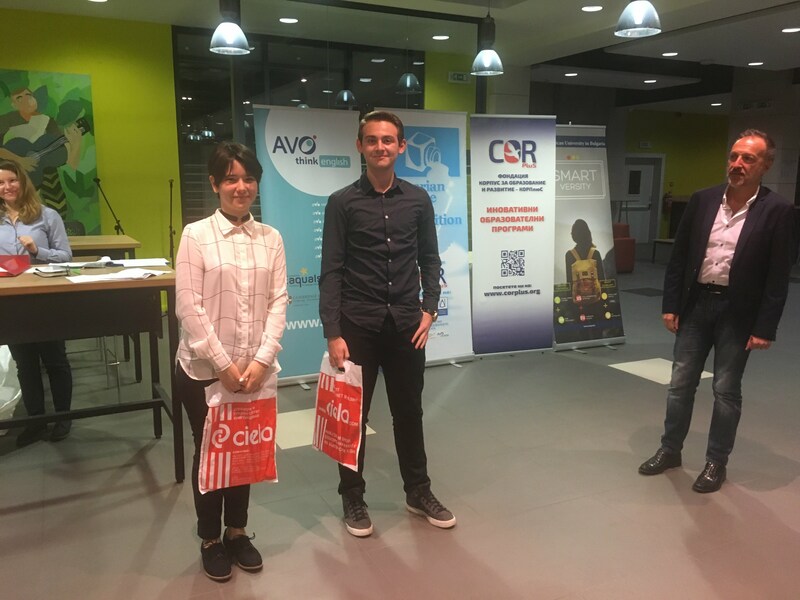 The 9th grade winners – Ouafa Hammoun, (St. st. Cyril and Metodius High School, Velingrad), Ivan Alexander Nikolov (St. st. Cyril and Metodius High School, Burgas) and Elina Stancheva (Vasil Karagyozov Language School, Yambol). 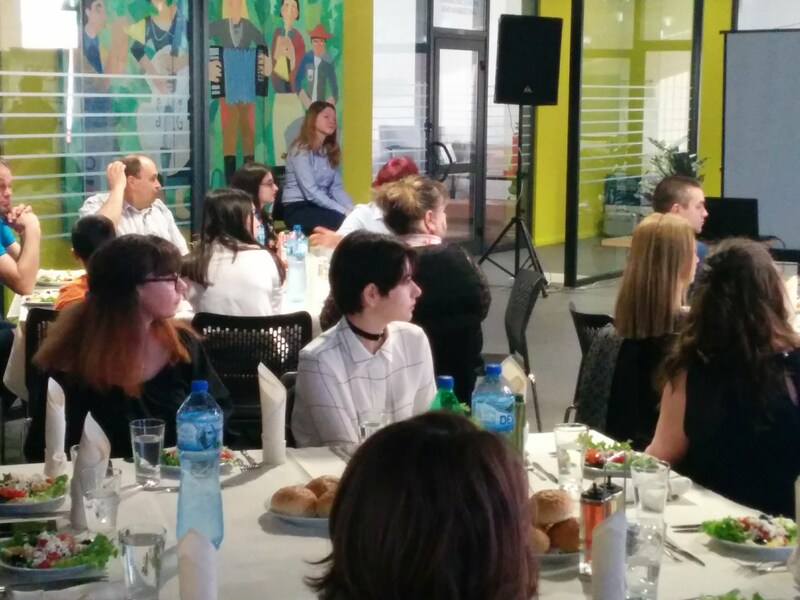 The 9th graders and their teachers. 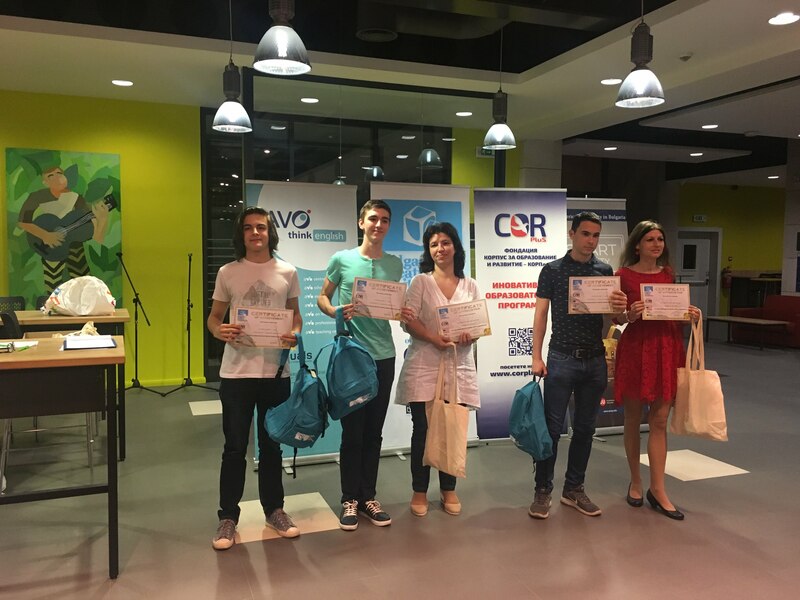 Todor Kantutis (Sofia Math and Science High School), Nicholas Brintnall (Tsanko Tserkovski High School, Polski Trambesh) and Kaloyan Georgiev (32nd Language High School, Sofia) – are the winners in the 10th grade category. 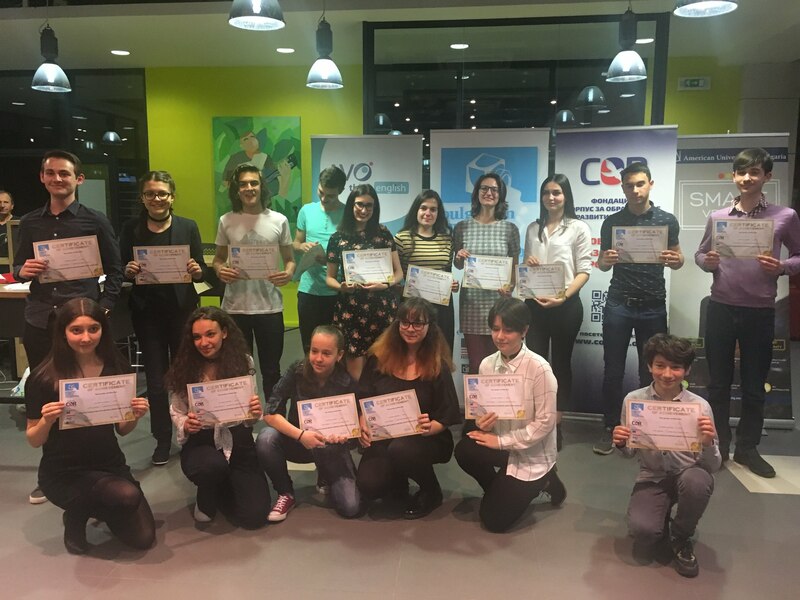 The 10th graders and their teachers. 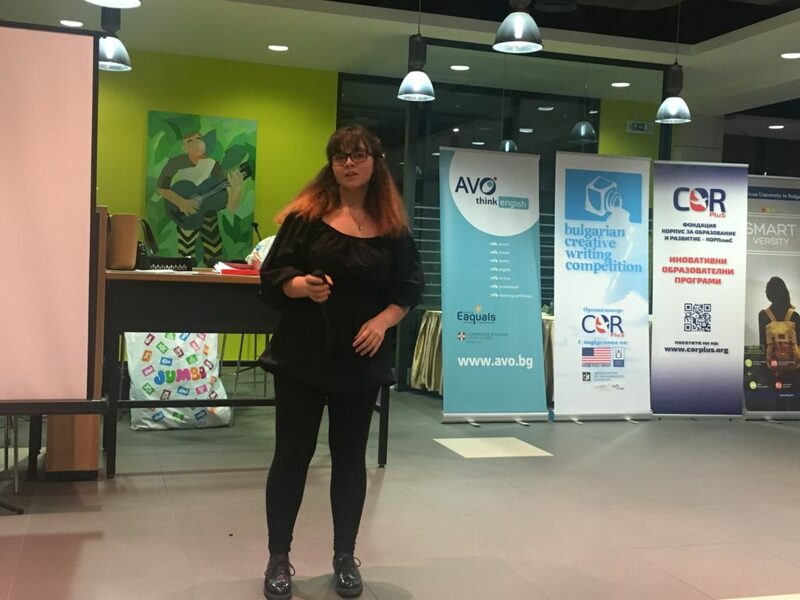 Elina Stancheva from Vasil Karagyozov Language School, Yambol sang a beautiful song. 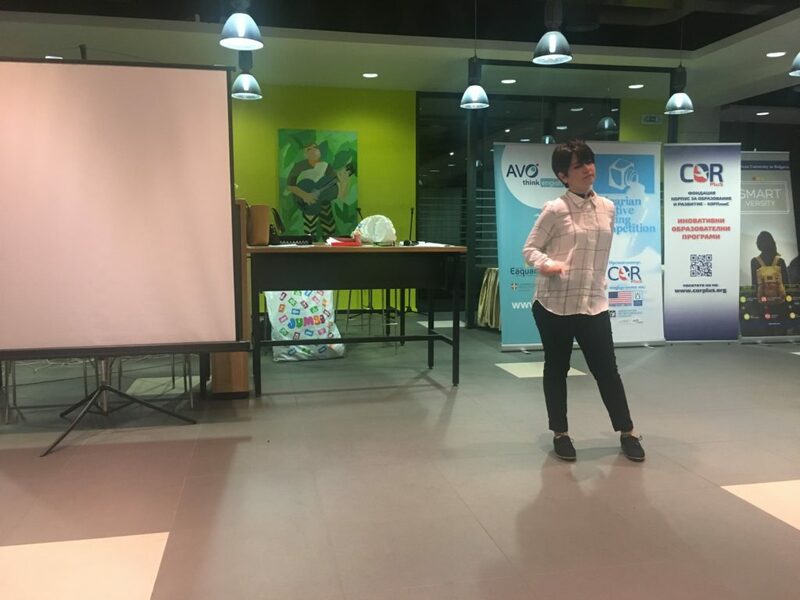 Yana Petrova from St. st. Cyril and Metodius High School, Kozloduy showed us a K-Pop dance. 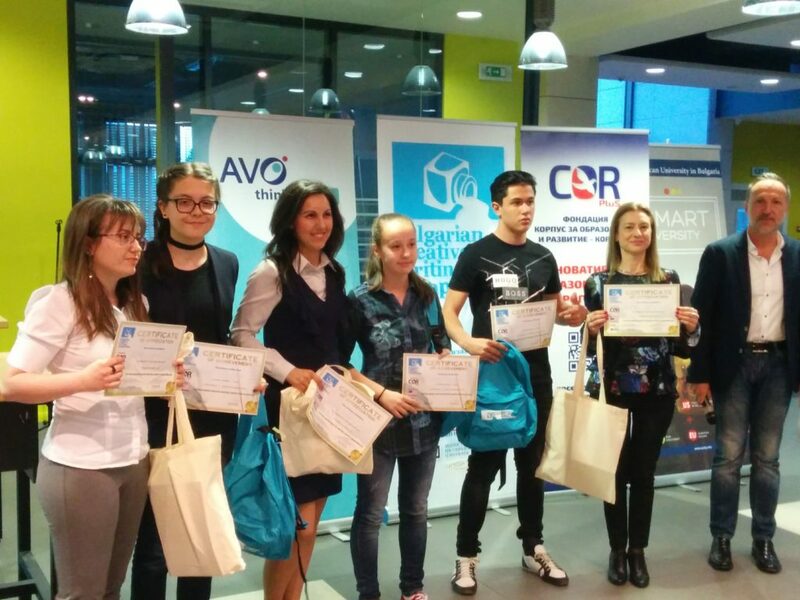 Radost Tudzharska (Otets Paisij Secondary school, Samokov) -1st palce and Adelina Dimitrova (Plovdiv Language School) – 3rd place among the 12th graders. 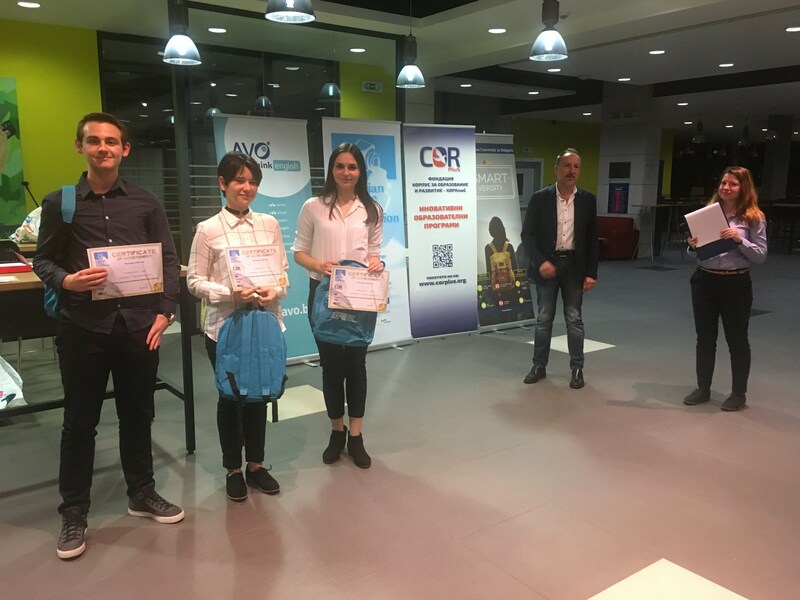 Zachary Karabashliev – the chairman of the national jury, gave two special awards for the students whose stories impressed him the most – Yana Petrova (St. st. Cyril and Metodius High School, Kozloduy) and Yasen Shopov (First English Language School, Sofia). 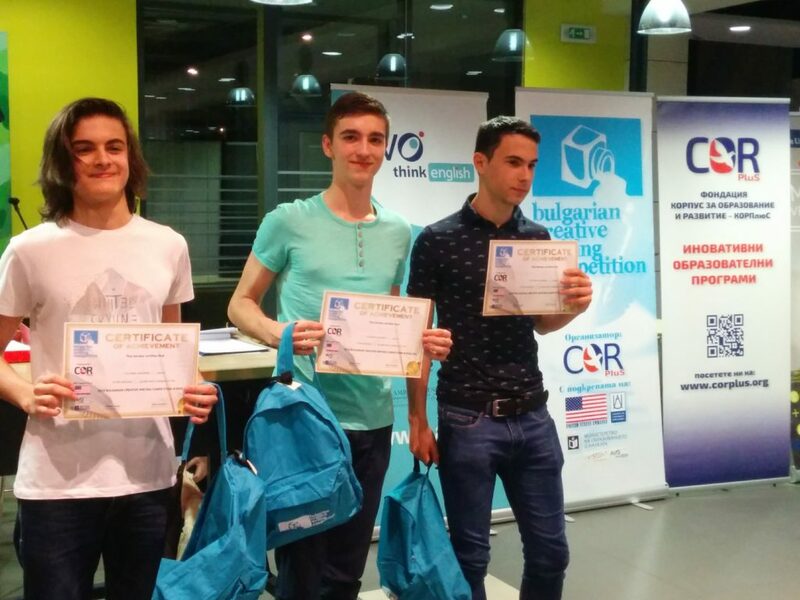 The special prize provided by British Council – a free IELTS exam, was awarded to Nicholas Brintnol (Tsanko Tserkovski High School, Polski Trambesh). 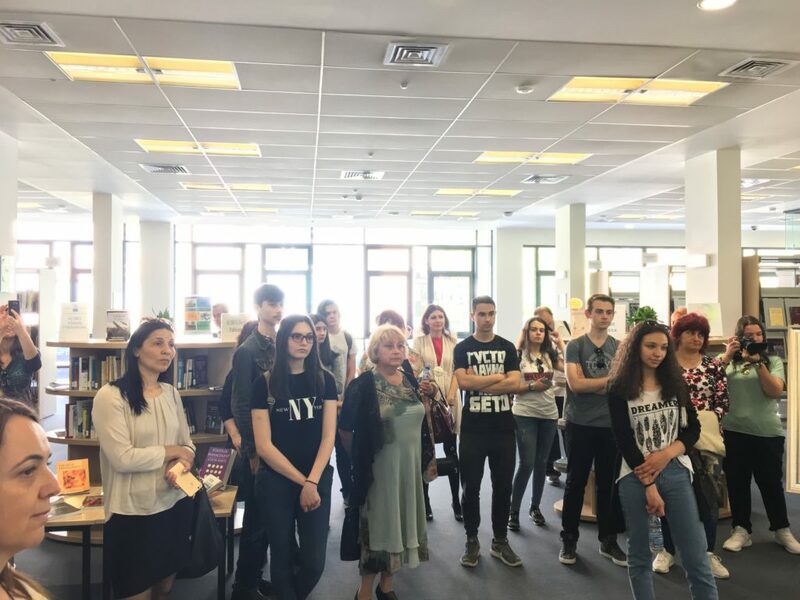 We want to thank all our partners for their generous contributions towards our project: US Embassy in Sofia, American University in Bulgaria and AVO Language and Examinations Centre.